Skip ahead to our infographic! People like to argue that millennials are entitled, but are they the generation most likely to live with their parents as adults? Studies show the millennial generation is most likely to continue living at home after completing school. According to the PEW Research Center, 15% of millennials still lived at home in 2016. That’s compared to 10% of Gen Xers in 2000 and 11% of late boomers in 1990. Only 8% of the early boomers and silent generation lived at home during their respective years. Whether it’s because of the economic climate or changing social standards, it’s clear that living with your parents into adulthood isn’t as taboo as it once was. We conducted a study of 1,000 adults across the United States to determine exactly who these people are. 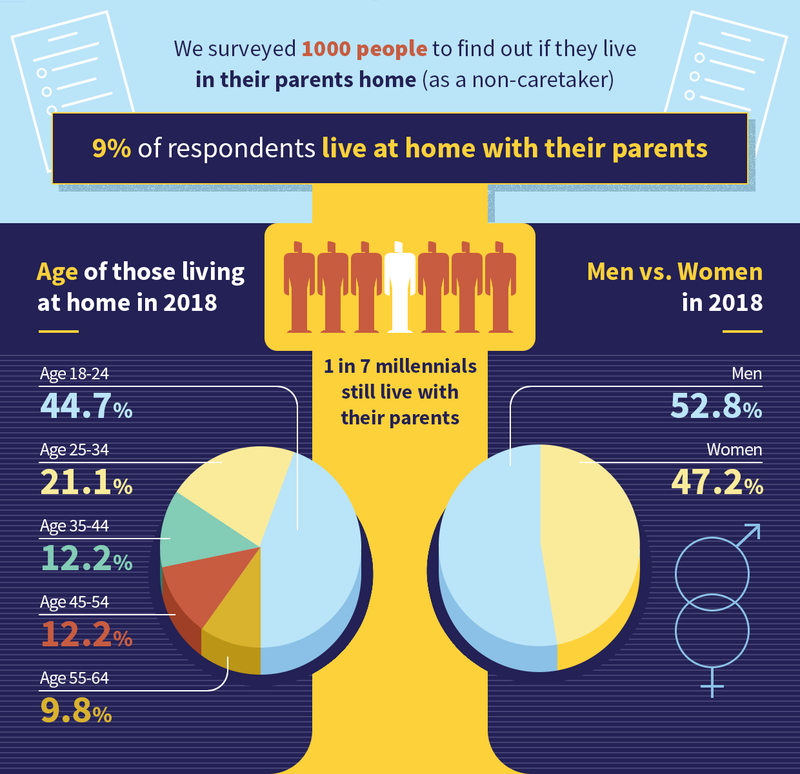 9% of those surveyed lived at home with their parents. We broke down the demographics to get a better sense of who exactly makes up that 9%. Of those living at home, 52.8% were men and 47.2% were women. In the age breakdown, the millennial generation saw the highest numbers. They make up a combined 65.8% of those living at home. 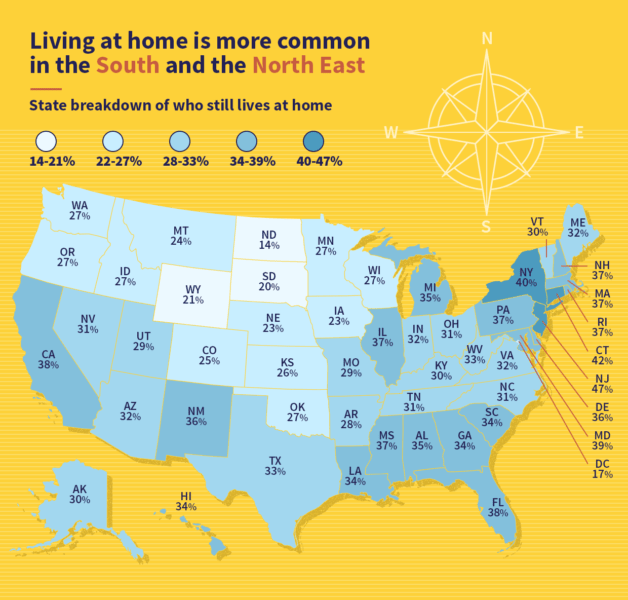 It seems that living at home is the most common in the South and North East. The middle states saw lower percentages. The states with more expensive real estate, like California, also saw higher percentages. The largest percentages of those who live at home with their parents are young adults. The largest group is 18-24 year olds and second is 25-34 year olds. With millennials taking over 65% of the pie it’s safe to say that young adults are the most likely to live at home. Studies show that millennial generations may define adulthood differently than previous generations. The U.S. Census Bureau reported that young adults consider certain milestones less important than they used to be. When the Census Bureau compared adults aged 18-34 in 1975 and 2016 they found that the numbers varied. 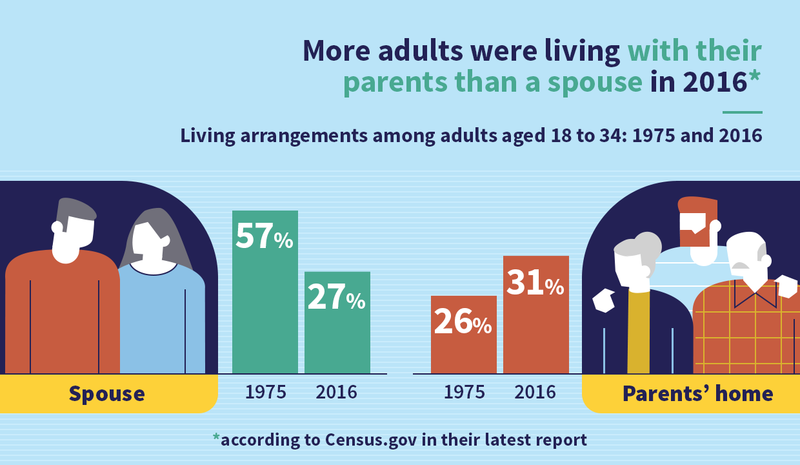 In 1975, 57% of young adults reported living with their spouse with only 26% living at home. In 2016 27% of young adults live with a spouse, while 31% reported living at home. The amount living with their parents has surpassed those living with a spouse! Yet 9.2% reported living with an unmarried partner as compared to 0.7% in 1975, which evens out that number more. Why Are Young Adults Living At Home? Who young adults live with goes hand in hand with their economic security. It would be easy to assume that the financial climate plays a large role in young adult decisions in the modern age. However, that might not always be the case. According to the PEW Research Center, only 5.1% of “older young adults” were unemployed in 2016, down 10% from the first quarter of 2010. This would lead us to believe that unemployment isn’t a major factor, but lower wages very well could be. Millennials are earning less than Generation X took home at the same age, according to Pew. 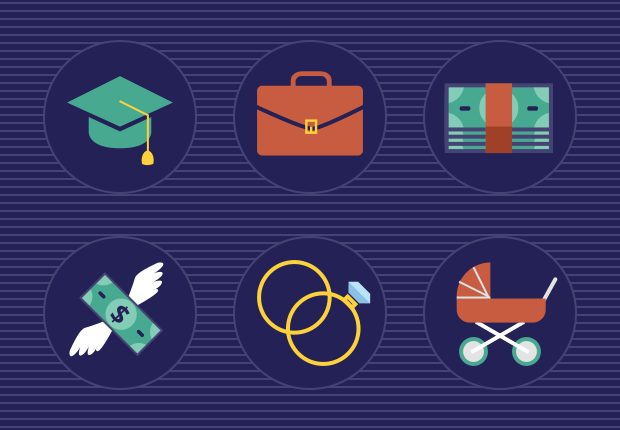 Millennial households in 2014 earned a median income of $61,003. That’s compared with an inflation-adjusted $63,365 for Gen Xers in 1998. Home prices are significantly higher than they’ve ever been. The New York Post reported in May 2017 that home prices were rising twice as fast as wages. Demand for homes is still very high in metropolitan areas, causing home prices in these areas to rise even further. With rent prices rising as well, many millennials are choosing to save money by living at home with their parents. Millennials are not staying at home forever, though. While traditional adult milestones like marriage, buying a home and starting a family are delayed, they are not foregone completely. In a world with transitioning roles and norms, millennials may be redefining what it means to be an adult.